Yesterday’s Pinstripe Birthday Celebrant was the son of a National League umpire. Today’s ex-Yankee birthday boy actually became a big league umpire himself, after his playing days were over and was also the father of an MLB player. 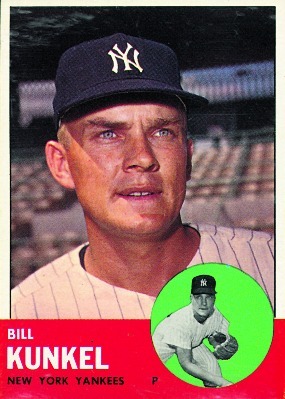 Bill Kunkel spent the third and final season of his big league career as a member of the Yankees’ 1963 bullpen. That squad won 104 regular season games, finishing a full ten and a half games ahead of the second place White Sox. With both Mickey Mantle and Roger Maris injured much of the season, the Bronx Bombers’ offense was pretty bomber-less that year and the team lived off its excellent pitching staff. Whitey Ford and Jim Bouton had outstanding 20-win seasons as starters and were joined in the rotation by fire-balling rookie, Al Downing and the veteran Ralph Terry. These four guys pitched deep into almost every game, easing the burden on a patched together Yankee bullpen that featured Hal Reniff as the closer. Kunkel was a valuable member of the relief staff as well, appearing in 22 games that season, winning three of his five decisions and posting an ERA of just 2.72. Kunkel was a New Jersey native who had originally been signed by the Red Sox in 1955, when he was nineteen years old. A right-hander, he bounced from organization to organization in the minors, finally getting his first taste of the big leagues with the Kansas City A’s in 1961. The Yankees got him from the Braves in the rule 5 draft of 1962. The 1963 season would be his only season with New York and also his final season as a big league pitcher. The Yankees released him and after he spent a couple more years pitching in the minors, he hung up his glove and turned to umpiring. He became an American League Umpire in 1968. He was good at his new craft and highly respected. His son Jeff became a big league infielder in 1984 and during that year’s exhibition season, when the younger Kunkel was designated to bring his team’s lineup card to home plate, the two became the first and only father and son to ever appear in a big league game as an umpire and player. Kunkel retired that August. At the time, he had already survived two bouts with cancer and was now facing a third. Sadly, the disease won the final encounter and Kunkel passed away in 1985 at the age of 47. He shares his birthday with a Yankee infielder who got into an infamous argument with an umpire that cost New York a postseason game. I will always remember a game in 63 when my brother tok me out towards the right field second deck overlooking the Yankee bullpen. My brother shouted down to Bill Kunkel, –“Hey, Bill, how’s the family?” Bill made the okay gesture and I had an amazing childhood memory. Thank you to a class organization for posting memories of Dad. He is the only person to ever referee in the ABA and NBA, Play in the major leagues, Play in a World Series, Umpire in the majors and World Series. Dad was one of a kind who should be in the hall of fame at Cooperstown.